He is the King of the Jungle, the Ruler of the Wild, and the ultimate symbol of Power and Strength. It's no wonder why humans fear and revere the image and reputation of the Lion. Even though it is a largely nocturnal animal, the Lion is seen as a symbol of the Sun and an embodiment of Passion. On the other hand, the Lioness is a representative of the Moon and is a symbol of Rationality, Motherhood, and Family in many cultures. Ever since the days of early humans some 32,000 years ago, we have been fascinated with these majestic creatures. The earliest known cave drawings depicted lionesses on the hunt and many scholars hold true to the belief that these drawings were a type of religious relief for the tribe's shamans and spiritual leaders. Ancient Egyptians built the famous Sphinx to commemorate the gods as well as these magnificent animals. To the Egyptians, a lioness was a being of Spirituality, a symbol of Maternity and Feminine Power. The goddesses, Bast and Sekhtmet, were often depicted as lionesses and both were worshipped as protectors of human souls. The gods Maahes (god of war) and Dedun (god of wealth and luxury) were also Egyptian gods that were often shown as powerful lions. This powerful civilization even built a temple city, Leontopolis, to honor these sacred animals. The Egyptians were not the only ones who drew spiritual inspiration from the Lion. The ancient Greeks were so enamored by these beasts, that they named one of their constellations, Leo, in honor of them. Famed Greek story teller, Aesop, regularly made use of the lion's powerful image to drive home his point about the moral fiber of society. The Greeks even had a version of the Sphinx who was a hybrid with a lion's body, a woman's face, and a bird's wings. According to legend, this winged lion was taken from her home in Ethiopia and placed in the sacred city of Thebes to protect it from persons unworthy of accessing the city's vast wealth and knowledge. The myth of the Riddle of the Sphinx stems from this tradition and gives credit to the image of the Lion as a being of Wisdom. The Lion's eye is all-seeing and every roar is believed to contain knowledge lost to the rest of the world. In the Judeo-Christian tradition, a lion's roar is symbolic of God's word for humanity. Countless authors and even Hollywood directors have toyed with this notion in their pieces. Take a second look at (or read of) the classic The Chronicles of Narnia: The Lion, The Witch, and The Wardrobe. The Lion, Aslan, plays a pivotal role as a source of inspiration and wisdom throughout the entire series. It may surprise you to know that Aslan is also the Turkish and Mongolian word for "lion". Lions are popular charges in the crest and coat of arms of ancient family lines. In Heraldry, they are seen as symbols of Strength, Valor, Honor, Power, and Nobility, as such, many royal houses across the globe have lions as part of their family crests. In fact, the lion has been a symbol of royalty since the days of the great empires in Egypt, Africa, and Mesopotamia. In temple reliefs, the pharaoh or tribal king was often depicted a crouching lion and in Indian dynasties, the animal was an emblem of the king from as early as 262 B.C. To this day, African kings adorned their formal attire with lion pelts as a sign of their status and wealth. Surprisingly, lionesses were the animals that were first seen as a symbol of Nobility and Power, not their male counterparts, the Lions. As a sign of respect for the Lioness's reputation as a fierce warrior and protector, many cultures across Africa and Middle East adorned important religious objects and temples with its image and a few even worshipped the femme fatale' as a sacred totem. The Lion plays a pivotal role in the Judeo-Christian and Islamic traditions. In Judaism, The Twelve Tribes of Israel were fathered by the great prophet, Jacob, who is commonly referred to as The Conquering Lion of Judah. It is the animal totem for the city of Jerusalem and in synagogues worldwide; lions adorn the Ark in which the Torah is stored, as a gesture to the prophet, Jacob, and in a symbolic show of protection for the word of God. Like Jacob, lions guard the divine message and help to pass it on to those willing to listen. Rastafarians believe that the Lion is a symbol of the Messiah and that Emperor Haile Selassie I was the earthly reincarnation of Jesus. In the Christian tradition, a lion is seen as both a force of evil and good. Many stories in the Bible center on lions either devouring those who have rejected the ways of Jesus Christ or threatening the lives of devout Christians (Daniel in the lion's den). For Muslims, the Lion is a symbol of Valor and Honor. In Hinduism, the lion, Narasimha, is an incarnation of the all-powerful god, Vishnu. The popular Indian name, Singh, originated as a way to pay homage to these powerful animal totems. Derived from the Sanskrit word for "Lion", Singh was originally used to refer to members of the military caste. A decree that was passed in 1699 stated that all baptized males Sikhs must adopt the name as a surname, regardless of their caste or geographic location. This decree helped to popularize the name, making the last it one of the most beloved surnames across India. It seems that no matter where you go the image of the Lion and the Lioness represents the best of humanity. No other animal throughout history has inspired fear, awe, respect, and reverence quite like the Lion. Wearing a Lion or Lioness Tattoo represents more than just having a great piece of body art; it is a symbol of your noble character and powerful persona. Lion and Lioness Tattoos come in a variety of styles and forms. The images can be stylized, like those images often seen in Buddhist and Hindu art, or they may realistically represent the actual animal like many African and Western art pieces. You can add dimension to whichever style you choose by carefully considering where the tattoo will be placed. A tattoo on top of a major muscle group gives an illusion of movement with each twitch, thus making your roaring lion stand out. It is important to note that even though most of the article focuses on the meaning of Lion Tattoos, in general, both the Lion and the Lioness represent the same spiritual and moral traditions. Lioness Tattoos have the added advantage of being linked with Family, Femininity, and Motherhood. The image of the Lion has a deep spiritual significance in many indigenous cultures worldwide. A Tribal Lion or Lioness Tattoo is one of the most well-known and respected images in the tattoo world and is often done in the belief that the lion's noble qualities will be infused into the wearer's being, thus making him like a fearsome and fearless lion. Tribal Lion or Lioness Tattoo represent your spiritual connection with a particular culture and tells the world that you value Honor, Courage, and Justice above everything else. The Conquering Lion of Judah is greatly revered in Rastafarian tradition. The Rasta Lion is often depicted with a golden crown while holding a scepter draped with the colors of Ethiopia. Not only is the Lion a symbol of Authority and Nobility, it is also an emblem of your connection to the spiritual teachings of the Rasta movement and pays homage to the ideas of tolerance, acceptance, and love for your fellow man. Lion and Lamb Tattoos hark back to various biblical stories in the Old and New Testament. Lions are emblems of Power, Strength and Masculinity, whereas a Lamb represents Innocence, spiritual and moral purity, as well as Femininity. This tattoo pays homage to your dual nature; within you there is a balance between your passionate and rational self. A Lion and Lamb Tattoo also has religious connotations. It is a tip of the hat to your strongly held Christian traditions. The Lamb represents a devout child of God being protected by the Divine, which is sometimes shown as a Lion (see Conquering Lion of Judah). Lion and Lamb Tattoos represent Balance and Protection, and identify you as a follower of the Christian faith. Although the exact meaning of each flower is different, in general, a delicate flower is a symbol of Femininity, Gracefulness, Elegance, Love, and Beauty. On the other hand, a lion is a symbol of Passion, Power, and Masculinity. A Lion Flower Tattoo juxtaposes two seemingly unrelated items to create a central meaning. It represents balance and your desire to find the middle ground between your passionate nature and your calmer senses. Dragons and lions are animals of power and brute strength. There is nothing delicate about these two beasts. They are masters of their realms; the Dragon is the King of the Mythical Beings and the Lion is the King of the Jungle. Lion and Dragon Tattoos represent Power, Authority, and Strength. Such a tattoo is dripping with Masculinity and announces your position as an Alpha Dog. In some cases, the tattoo may have a lioness and a dragon instead of a lion and a dragon. In these art pieces, the images symbolize a balance between the Feminine and the Masculine. A roaring lion is an animal to be respected and feared. It is a symbol of Power and Authority, and a sign that you aren't a person to be taken lightly. Roaring lions are born leaders, gifted fighters, and, in a crunch, are the persons who can best guide the group out of danger. According to the tradition, a lion whelp was still-born, but brought to life by the roar of his father. The whelp later went on to create and lead the tribes of Israel. The symbolism shows that the word of the Divine (represented by the roaring Lion) has the power to breathe life into weakest being (the whelp) and transform him into a force to be reckoned with. A Roaring Lion Tattoo expresses to the world that your aren't a push over and that a beast lies underneath the surface, primed and ready to strike. A cat's paw is a symbol of Progress and Achievement; the same meaning can also be extended incorporate a lion's paw. A Lion Paw Tattoo not only represents progress, it also embodies Protection and Bravery. Templar Knights adorned their shields and body armor with images of lion paws to show their courage and their adherence to the duty of protecting the innocent. In Freemasonry, the Lion's Paw was used to represent Transformation and Enlightenment. By spiritually moving out of Darkness and Ignorance into the realm of Light and Knowledge, a freemason was transforming his life and taking the relevant steps towards Enlightenment. A Lion Paw Tattoo also represents Guidance and Wisdom. It shows your desire for personal and spiritual fulfillment. Although lions aren't native to much of Asia (except in India), they are still central figures in many Asian cultures. The symbolism of the Lion was brought over to places like Japan and China by travelling Hindus and Buddhist monks , before slowly diffusing into the cultural fabric of these countries. Japanese Lion Tattoos (also known as Asiatic Lions) are very stylized and don't actually represent a true depiction of the animal. These tattoos embody Valor, Honor, and Justice, concepts that were revered in the Samurai culture. The Lioness is the Queen of the Jungle. She is revered for her fierce loyalty to her pride and cubs, as well as her fighting spirit. Lionesses are seen as the ultimate mothers and powerful symbols of Femininity and Family. They are some of the few symbols of femininity that are also known for their expertise as warriors. Egyptians, Greeks, Africans, Romans, and other ancient civilizations built temples and monuments in honor of the Lioness and her elevated status as a fierce protector of the innocent. Lioness Tattoos express to the world that you strongly identify with these powerful animal totems and, although overwhelmingly worn by strong women, the image of the Lioness isn't reserved solely for females. 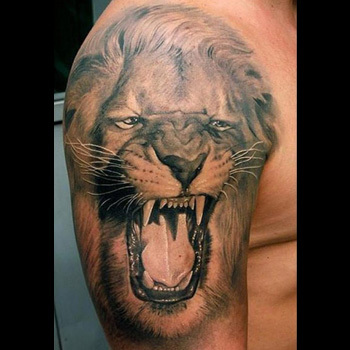 There are a number of men who get Lioness Tattoos in honor of a powerful woman in their lives. A Lion or Lioness Tattoo is a great way to show to the world that you are a nature born leader. This design speaks to your authoritative personality and powerful persona. You can add any number of elements to the tattoo design, so get creative and dream big! The only limit to your masterpiece is your imagination. If you need inspiration, our team of artists can help bring your ideas to life. Visit our design page at www.itattoodesigns.com and take advantage of our Custom Design Service.